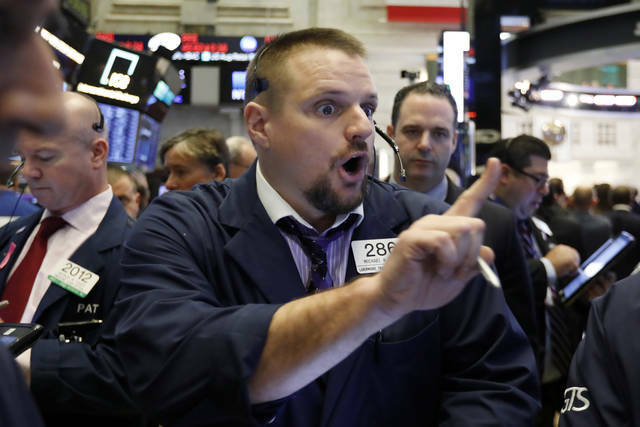 NEW YORK (AP) — After a wobbly day of trading, U.S. stocks fell for the seventh time in eight days Monday as technology companies continued to slide. Industrial and high-dividend companies rose, and the market’s losses were limited relative to the steep losses it suffered last week. “The more the company’s valuation is dependent on some profit way ahead in time as opposed to the profits coming today, the more rate hikes should impact the valuation of that company,” he said. Pride said the recent downturn is a healthy development for stocks. “A five to 10 percent pullback of that magnitude is very normal and very reasonable for this market to go through,” he said. The technology companies that have led the market higher in recent years, including some of the world’s most valuable companies, continued to decline. Apple gave up 2.1 percent to $217.36 and chipmaker Nvidia slipped 3.4 percent to $235.38. Netflix, which is scheduled to report its third-quarter results late Tuesday, fell 1.9 percent to $333.13. It’s fallen 20.5 percent since disclosing weak user growth three months ago. Bank of America’s third-quarter profit and revenue were better than analysts expected, but Wall Street was disappointed with the company’s loan growth. The company has emphasized responsible growth recently, and like other banks, it’s benefiting from last year’s corporate tax cut and rising interest rates. Its stock slipped 1.9 percent to $27.92. Rising bond yields often lead to losses for high-dividend companies because many investors think of them as alternatives to bonds. That pattern hasn’t held up in the last few days as investors have been looking for relatively safe picks on the stock market. Germany’s DAX jumped 0.8 percent and the FTSE 100 in Britain rose 0.5 percent. France’s CAC 40 fell less than 0.1 percent. Japan’s benchmark Nikkei 225 dipped 1.9 percent and the South Korean Kospi edged down 0.8 percent. Hong Kong’s Hang Seng fell 1.5 percent. The Hang Seng index in Hong Kong has fallen 22 percent since early January, meeting Wall Street’s definition of a “bear market,” or a decline of 20 percent from a recent peak. A number of other indexes have fallen at least 10 percent, known as a “correction.” Those include the DAX and Kospi, which both peaked in late January, and the FTSE 100, the Ibex in Spain and the FTSE MIB in Italy, which peaked in May.